-The document attached illustrates the importance of coordination and integration of services. Many youth and service providers have expressed the challenges of accessing multiple services or agencies. Currently, there are services for TAY provided by multiple agencies within L.A. County. 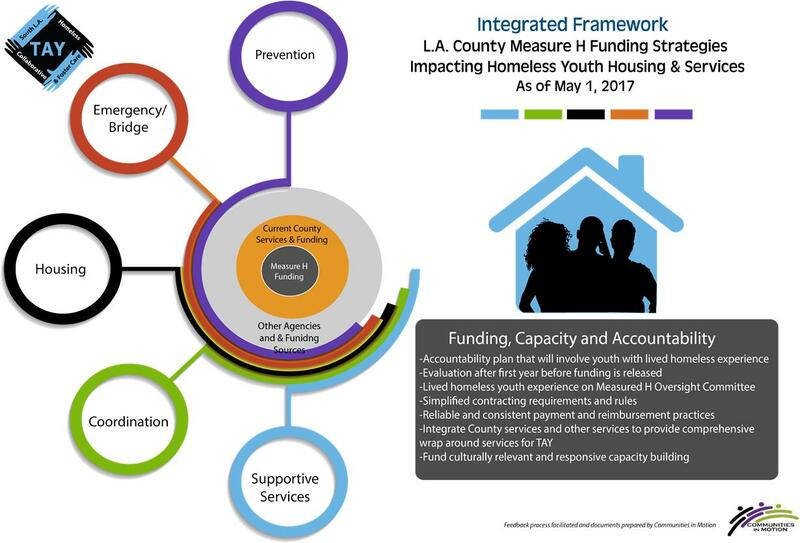 The Collaborative recommends a closer look and additional planning to integrate current services with Measure H funding to maximize resources available to prevent and end youth homelessness. -It is important to note that consistently, youth and young adults emphasized the importance of mentoring and counseling, which speaks to the need to ensure wrap around services and comprehensive case management is provided along with any housing. Providers also expressed the importance of supportive services beyond housing navigators. -The lack of enough available services and resources in South L.A. was expressed by both youth and the community, highlighting the importance of building service capacity. Youth expressed concerns about the rapid rehousing program as it does not provide sufficient supportive services. Former foster care youth expressed that program type does not meet the needs of youth who still need counseling and case management to accompany housing. -Cultural humility was consistently expressed by all stakeholders, ranging from the training of staff who serve our youth, to the the types of capacity building that might be made available through Measure H. We recommend that a targeted capacity building effort be made in South L.A. to expand services.